1. 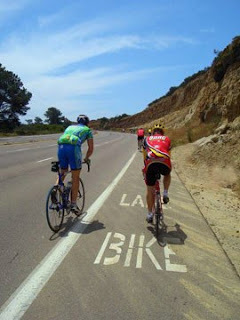 Riding your bike uphill is a great workout and is one of the quickest ways to become a stronger rider. When riding on the flat (unless heading into the wind) it’s easy to coast along, letting your momentum do a lot of the work. On a long enough hill, momentum is out of the picture, so you’re forced to work hard all the way to the top. As you become stronger, you’ll be able to cover more ground on the flat more quickly and with less fatigue, making even your flatland riding more enjoyable. 3. Because the hills in mid-Michigan are so low, you’re probably going to have to do hill repeats to get in a good workout. For instance, The Wall is about 400 feet high with the last 100 feet being the steepest, and it comes at the end of a long day on the DALMAC. If your nearest bikeable hill has a gain of 100 feet, you’d need to do that at least four times at the end of a long ride. I say “at least four times” because doing one long 400-foot hill is a lot harder than doing 4×100 with rests in between. So that’s six or eight times up and down. If you’re doing a shorter ride focusing on hill training, you’ll want to do even more repeats. 4. Whatever you’re getting in shape for, hill training makes the best use of your time. It’s essentially interval training, which has many benefits, including increased fat burning, cardiovascular improvements, and preservation of lean body mass. Most of all, it’s efficient, meaning you can get a great workout in an hour or less. 5. Hill training can be a sociable way for unevenly matched cyclists to challenge themselves at a level appropriate to each rider, while still riding more or less together. In our cycling group, those who want to challenge themselves on the hills will charge to the top and then wait for the others to catch up on the downhill, or even do a hill repeat while waiting for the slower riders. If we’re all doing hill repeats, we can at least wave to each other as we do the laps, regrouping for the warmdown as we head back to the start of the ride. If you aren’t already accustomed to intense workouts, it’s a good idea to check with your doctor before starting a new, more intense regimen. Always include a warmup of 15 to 20 minutes easy riding before starting the hills. Shift early and often. If you wait until the hill gets steep and your cadence slows down, shifting to a lower gear becomes more difficult. Try to keep your cadence high, 80 to 90 RPM or more. The first time up a hill, find a comfortable cadence you can maintain indefinitely. If you find yourself at the top with plenty of breath left, try a harder gear the next time up. Coast the downhills. For ideal interval training, the rest interval should be twice as long as the work interval. 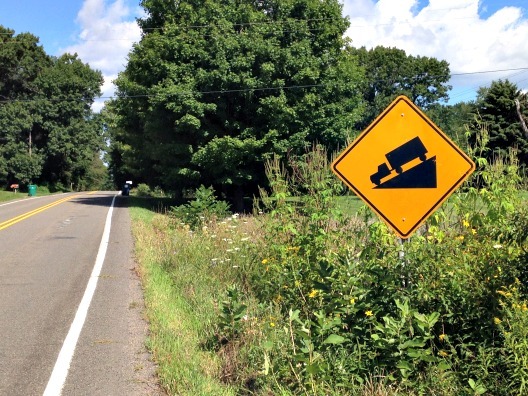 If the hill is short — less than 100 feet — start from a near-standstill at the bottom. Using momentum to carry you part way up a short hill is “cheating” in hill training. Always allow for a warmdown of 15 to 20 minutes after your hill workout. I’ve covered nine hilly routes so far, from Grand Rapids to Ann Arbor, and as far south as Jackson. They’re listed below, with the approximate location, the distance, and the total elevation gain (which you can vary by doing more or fewer hill repeats). Or you can find an excerpt of each route description here.